The German tale of Faust has inspired a number of productions over the years, but presumably none as gory and high-octane as this Jamie Lloyd Company adaptation. This is a sort of hybrid version, featuring the opening and closing scenes from Marlowe’s original production, with a new reworked middle. The core premise still remains; a talented doctor sells his soul to pursue fame and fortune, at the price of remaining consistently taunted by the Devil. The new middle section brings the play up to date (in terms of tone and language), creating a parable for the reality TV age, with Faustus as a Derren Brown style illusionist, fighting off the attentions of an adoring public. This reworking is a noble enterprise; Marlowe’s original middle is notoriously flimsy and seems fair game for a rewrite. However, if you going to add to a classic, it needs to be substantially better than what preceded it. Despite some occasionally inspired moments, a lot of the new dialogue drags, failing to produce anything more than occasional revulsion. Character development is mainly eschewed in favour of shock tactics and panto-style popular culture references. There are so many competing ideas at work that the whole production often feels a rather jumbled mess; I am fairly familiar with the text and yet often found the new plot hard to follow. The relentless darkness and bleakness of the production was reinforced by some massively hysterical over-acting. The relentless screeching and mugging from the ensemble became increasingly annoying; the more settled and emotive second half was much stronger than the perplexing first. Jenna Russell clearly understood this and was a considerable bright spot as Mephistopheles. Her quietly understated evil was way more powerful than a lot of the carnage developing around her, especially Forbes Masson’s cartoonish Lucifer. 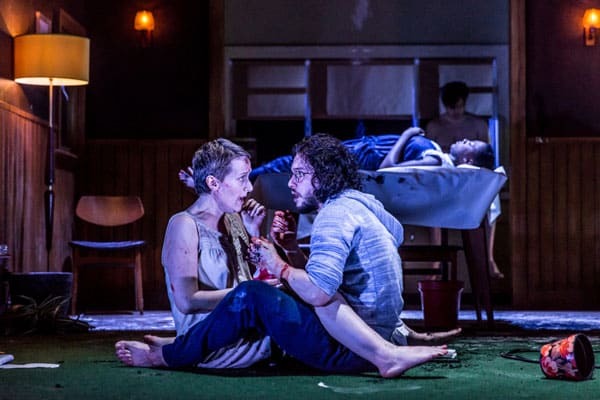 A lot of the attention was understandably on Game of Thrones’ Kit Harington in the lead role of Faustus (not least because creator George R. R. Martin was in the audience). Harington was brilliantly conflicted in the title role, making the most of an often laboured script. It is an emotionally and physically demanding performance and Harington crosses effortlessly from 16th century to modern dialogue. The most appealing part of this production is unusually, the staging from Soutra Gilmour and the lighting from Jon Clark. The set is constantly moving, exposing the depth and height that lies in the area behind it. These constantly shifting perspectives, combined with stark and ominous lighting, created a deeply unsettling effect. There’s also some enjoyable movement and effects from Scott Penrose and Polly Bennett, however these sequences could have been used more sparingly for maximum impact. Doctor Faustus is a production that tries to achieve a lot, and only partially succeeds. It is an artfully staged production that is high in intensity but critically low in heart and coherence. 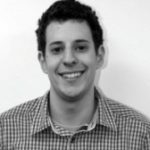 Danny Coleman-Cooke is an experienced writer, who covers news, sport and comedy for high-profile personalities and broadcasters. His speeches and scripts can be seen on stage, on primetime TV and in Parliament, broadcast to wide and diverse audiences. His experience includes writing for the BBC’s Have I Got News for You, Channel 4’s Paralympics coverage, and the Premier League’s live match commentary. He has also managed social media accounts for a number of major brands, including Tesco, The Guardian and the BBC. He’s also a well-established speechwriter, scriptwriter and copywriter and has written for a wide range of famous faces in the world of politics and entertainment. He recently had his first theatrical credit, as co-writer of a musical adaptation of Beowulf, which toured the Midlands and was performed at the Royal Albert Hall. Danny is a huge theatre fan and was part of the writing team for the 2015 and 2016 Olivier Awards.